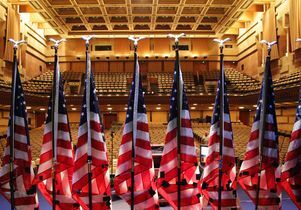 The conversation, which will take place at UCLA’s Royce Hall, will give candidates an opportunity to speak about their policy platforms and plans to move LGBTQ equality forward. The UCLA Luskin School of Public Affairs and the Human Rights Campaign Foundation, the educational arm of the nation’s largest lesbian, gay, bisexual, transgender and queer civil rights organization, will co-host a forum for 2020 Democratic presidential candidates this fall. The conversation will take place on Oct. 10 — the eve of National Coming Out Day — in UCLA’s historic Royce Hall, and it will give candidates an opportunity to speak about their policy platforms and plans to move LGBTQ equality forward. The forum will be part of UCLA’s Luskin Lecture Series, which enhances public discourse on topics relevant to the betterment of society. The series demonstrates UCLA Luskin’s commitment to encouraging innovative breakthroughs and creative solutions to formidable public policy challenges. As in other presidential candidate forums, Democratic candidates can qualify for the event by receiving 1 percent or more of the vote in three separate national polls or by receiving donations from 65,000 different people in 20 different states. Today, in 30 states, LGBTQ people remain at risk of being fired, evicted or denied services because of who they are. Thirty-five states have yet to outlaw the dangerous and debunked practice known as “conversion therapy.” LGBTQ youth continue to face elevated levels of bullying and rejection, and many associated physical and mental health challenges. According to FBI hate crimes statistics from 2017, the most recently available data, the bureau reported a surge in hate crimes disproportionately affecting LGBTQ people, black people and religious minorities, especially those living at the intersection of multiple identities. And at least 100 transgender people — most of whom are transgender women of color — have been murdered in the United States since the beginning of 2015. The forum will be held in the midst of UCLA’s centennial year, when the campus will recognize its many contributions to Los Angeles, the nation and the world since its founding in 1919, as well as looking ahead to another century of discovery and achievement. HRC worked to mobilize the powerful LGBTQ voting bloc in the 2018 midterms, endorsing more than 480 pro-equality candidates nationwide, and deploying 150 staff to organize and mobilize voters in more than 70 congressional, targeted U.S. Senate and other key races across 23 states. On Election Day, exit polling showed that more than 7 million LGBTQ voters — 6 percent of total turnout — cast ballots, making the difference in key races from coast to coast. Electing a pro-equality majority in the U.S. House of Representatives has already made a huge impact; Speaker Nancy Pelosi has made it a top priority to pass the Equality Act, a federal LGBTQ civil rights bill that will provide consistent and explicit non-discrimination protections for LGBTQ people from coast to coast. This legislation is expected to be introduced soon amid an unprecedented level of support from members of Congress, national advocacy organizations and leading U.S. companies. HRC last hosted presidential forums in 2004 and 2007. In 2004, HRC’s forum included Sen. John Kerry, Rep. Dennis Kucinich, Sen. Carol Moseley Braun, Gov. Howard Dean, Sen. Joe Lieberman, Rev. Al Sharpton and Rep. Richard Gephardt. In 2007, HRC’s forum included then-Senator Hillary Clinton, then-Senator Barack Obama, Sen. Mike Gravel, Rep. Dennis Kucinich, former Sen. John Edwards and Gov. Bill Richardson. Tickets to the candidate forum will be free of charge. Details regarding the RSVP process will be made available later on the UCLA Luskin website. 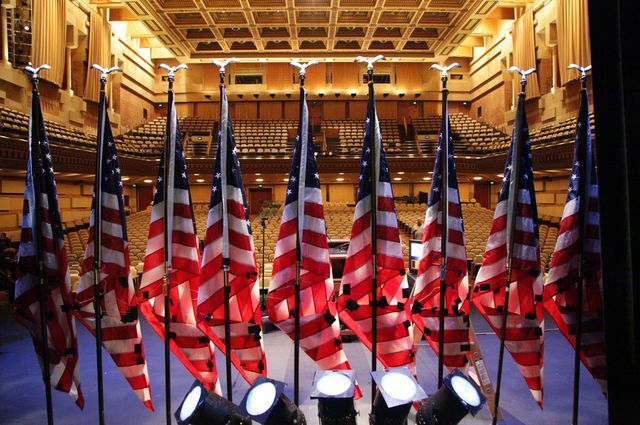 U.S. flags on the stage at UCLA's Royce Hall.